The online gambling industry will always be booming and alive. MaChance Casino is simply one of the proofs that the online casinos are still active in providing us a remarkable gambling experience. This is a site that features a huge collection of games under different categories and not just the typical slots games. The website is also guaranteed to have convenient features that befits the standards of today’s online gamblers. 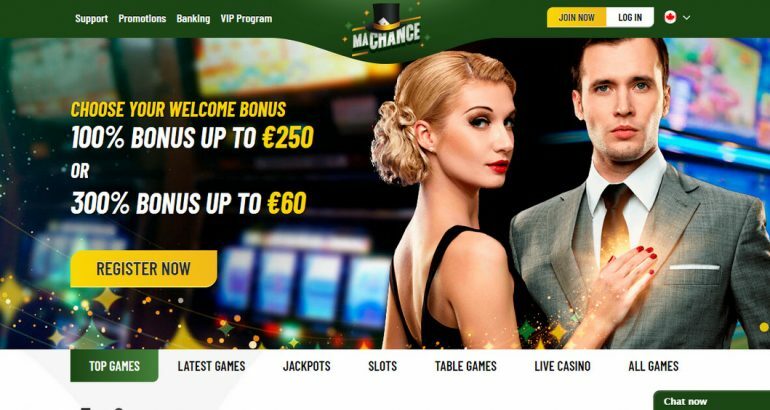 MaChance is proof that the online gambling industry is not yet dead because this site is one of the newest casinos that got released this May 2018 only. This new site aims for a brand new experience for many online gamblers around the world. That’s why the site built partnerships with many software providers first before it decided to release its own web platform for online betting at a later date. The developer team at MaChance Casino are more than 10 – guaranteeing players that the games are well-programmed for their convenience. The casino doesn’t only have their own set of games; their partnerships with other sites enabled them to provide games under other brands such as BetSoft. The site’s resulting amount of games ranges at 500 already – giving you limitless options on any type of casino game you may want to play. The casino is also made using HTML 5 and Flash to ensure that everything in the site will operate smoothly for an interactive gaming experience on both web and mobile browsers. The games are also well-programmed to provide instantaneous access due to instant lay features. Each of the software in the site is audited by the GLI to ensure stability and fair programming. The site is also secured with SSL to provide excellent protection against attackers who may hack your account. Legend of Cleopatra – This legendary queen can bring you towards alluring riches once you visit this Egyptian-themed game. Booming 777 Deluxe – This classic slots game can provide a fair gaming experience with high RTP. This is also perfect for those who don’t want extra features on their slots game. European Roulette – This is an excellent game for those gamblers who want to win fast under a different game than slots. The site has a bonus wheel feature where you can get a random deposit bonus. This is accessible to members only and can be accessed at certain schedules. The withdrawal speed of this website is known to be faster than most online casinos of today. This just shows that MaChance casino is aiming for a new trend in casino payouts. Joining in the casino can give you two types of welcome bonus: a 100% bonus for up to €250, or a whopping 300% bonus for up to €60. This bonus is available during registration upon being a member. MaChance Casino is making sure that everything in it will be a new online gambling experience. That’s why they decided to open its borders to any parts of the world so then all gamblers can enjoy in unity. The casino is operating under the Curacao gaming license which enables Machance to accept almost every country it desires since this jurisdiction does not ban specific regions from playing at online casinos. MaChance Casino may be one of the new generation websites that dedicates their time in online gambling. But take note that they are providing excellent services right away, not just a huge number of games to leave you confused on what to choose first. MaChance casino also ensures that everyone will be accommodated fairly in the site, and no gambler will get addicted due to the site’s responsible gaming policy!